There’s always something we can learn from people that have been able to do things that we still only dream about. When I was younger I used to watch Texas Rangers on TV, and I laughed a lot. Chuck Norris from Texas Rangers is obviously admired by a whole lot of other people as well, because the amount of Chuck Norris jokes online is huge. That’s understandable, because the character really was funny. Chuck Norris is a wise guy. Although the rest of us can’t make the book give us the information just by intense staring, it is much more efficient to not just read a book in a linear way. When Chuck Norris stares them down, you might want to achieve the same results by skipping down to read only the main bullet points first and then only read the most important parts of the text and skip the unnecessary sections. Another good point that we can learn from Chuck Norris’ reading skills is that he seems to be pretty intense when he stares the book down. It is almost impossible to learn anything well without focusing, so just like Chuck Norris, you should focus intensely when you read something important. Sometimes you might want to stop for a while and just focus on understanding what you just read, before continuing. Chuck Norris may not fight himself because he knows that he would win anyway, but you should definitely fight yourself and win. Usually you are your worst enemy when going after your dreams. The things that often hold people back from pursuing their passion and drive are fear and jealousy. That fear is only in your head, and there are many great examples of people who admit that they feel fear sometimes, unlike Chuck Norris, and still are able to act and win themselves. Jealousy makes us often jump to conclusions without first analyzing the situation. It is a powerful negative force that holds many people back in life. 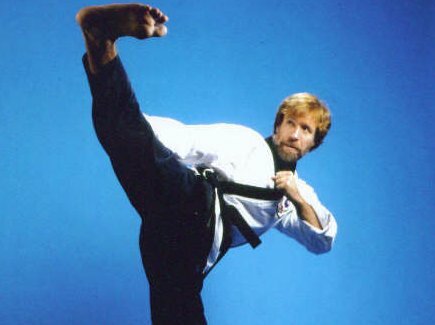 Chuck Norris would not let his own negative energy beat him; he would beat his own negativity with a roundhouse kick instead. Be like Chuck Norris, be awesome. Although Chuck Norris may not be the most loveable person in the world, you still want to have the impact of awesomeness when you walk into a room. The negative feelings of other people should be destroyed instantly because you are a positive person who wants to make other people feel good. That kind of people will almost definitely succeed in life because other people are willing to support them. The easiest way to start being positive and being awesome is smiling; It makes other people feel that they are unconditionally accepted, and it also makes them feel valuable, important, and worthwhile, when you talk to them. If you make people feel good by smiling and greeting them positively, they will want to reciprocate by treating you the same way. When you don’t feel like smiling at all, you can still act your way into feeling. Force yourself to smile genuinely at new people you meet for just five minutes, and you will break up the clouds of negativity and start to actually feel positive. Please don’t set ants on fire with any tool, but what we can learn from Chuck Norris here is that almost anything is possible for us. And while it may sound ridiculous or naïve at first, it actually is true. If someone would have said one hundred years ago that humankind is going to travel to the moon quite soon, no one would have believed it, but eventually the skeptics were proved wrong. First it was just an idea in someone’s head, which seemed to be impossible, but with enough motivation, dedication, learning, and co-operation it was eventually proved to be possible. There are so many things that you can do, too – things that now seem to be impossible for you. Just believe in yourself, start working, and you will find ways of achieving your dreams and doing things you thought were impossible for you. People are like living lie-detectors. Some of us spot fake people more easily than others, but usually it is very short-lasting strategy to try to be something else than you really are. When you learn new things regarding self-improvement, it is often necessary to do something that feels a bit unnatural at first, but learning that way is completely different thing from acting like someone else all the time. Originality comes from sincerity. Be yourself, don’t deny yourself. People always love sincerity and authenticity more than anything. It doesn’t matter if you are perfect or not – no one is. When you show even your quirks openly to the world, you will gain respect and friends so much more easily than by acting to be perfect. Petteri Ollila is a happiness hunter, trying to find the holy grail of long-term happiness at his blog Happiness Hunters. If you want to learn how to feel good, you will love his new free e-book “The Guide to Happiness: 9 Effective Steps to Improve Your Mood Permanently”.